Spirit Aflame: Apologetic Tract Are Mormons Christians? From the perspective of Mormons, they profess not only to be Christian but the only true Christian Church. From the perspective of the Catholic Church and some Protestant communities, the Latter Day Saints, or Mormons, are more of a cult or sect than a Christian Church. The basis for this conclusion comes from their tenets. Let me try to explain some of the basic beliefs of the Mormons. They believe that the Mormon Church is the only true Christian Church. They state that after the death of the Apostles, the Church fell into error and has remained in this state until the true authority was restored in the 1800’s. This happened when the apostles Peter, James and John appeared as heavenly messengers sent by Jesus and conferred the restored authority on Joseph Smith and Oliver Cowley. These two men, in turn, have restored the Church with its original mandate upon the earth. Accordingly, all churches except the Mormon Church are abominations in the sight of God. As Catholics, we believe that there has been an unbroken apostolic authority from Jesus through Peter to the present Holy Father. Yes, there have been difficult periods over that time frame, but the promise of Jesus to be with the Church until the end of time and to send the Holy Spirit to be with the Church as its guide to the end of the ages has not been broken. The basic apostolic teachings, the Scriptures and worship of God in Spirit and truth are the same today as it was in apostolic times. That is why we profess: “We believe in One, Holy, Catholic and Apostolic Church.” The Church believes it is the true Church founded by Jesus Christ upon the foundation of the Apostles. However, it does not see others who hold some of the same teachings as abominations, but as separated brothers. The Mormons speak about the Father, Son and Holy Ghost as three separate beings who are “one in purpose.” But they do not believe in the Trinity as we do. They see God as the Heavenly Father who has a physical body. Jesus Christ is called Son of God and Savior. But Jesus was originally one of the spirit beings that all humans used to be and who became God. For Mormons, Jesus is not the eternal Word of God (Jn 1:1) or God Himself. He is a spiritual being who won a contest over Satan to be the redeemer. It was then he was given a body through the Virgin birth to Mary. As far as the Holy Ghost, he too is a separate being from God and Jesus but not co-eternal with God and thus not God. Mormons do not believe in original sin. There is only personal sin. Once Jesus died for sin, children come into the world without sin. Therefore, according to the Mormons, there is no need for infant baptism. After a month of the birth of a child to a Mormon parent (one sealed in the Temple), the child is blessed and given a name and is known as a “child of record.” Once this child reaches the age of 8, the child is invited to be baptized and confirmed. It is at this point the child becomes a member of the Church. For Catholics, we believe in original sin and that everyone, except Jesus and Mary, is born separated from God. It is in the Sacrament of Baptism that a person is freed from all sin (original and personal) and adopted as a son or daughter of God, incorporated as a member of the Church, and share in God’s life through the presence of the Holy Spirit. For Mormons, Baptism is done by a member who belongs to the Melchizedeck Priesthood (see below). Baptism is by immersion only. This Baptism takes away any sin the child may have committed once the person comes to know the difference between right and wrong. Through Baptism a person enters into a covenant with God. The person promises to take on the name of Christ and to follow his commandments. In turn God promises to provide the companionship of the Holy Spirit as a help to the person. The person is, at the same time, confirmed. Because of the views of Mormons about God and Jesus, as Catholics, we believe that Mormons converting to the Catholic Church must be re-baptized. Their baptism is not the same as that intended by Christ and taught by the Church since apostolic times. In other words, we do not accept their baptism as valid. What we refer to as Eucharist or Communion, Mormons use the term the Sacrament. They believe that, if they sin after baptism, those sins are taken away by partaking in the Sacrament each week. What is the Sacrament? During their weekly service, bread and water (not wine) are blessed by one in authority and distributed to the congregation, who eat and drink. The bread and water stand for symbols or reminders of Jesus’ body and blood. Where, as Catholics, we believe that this is the real Body and Blood of Jesus, not a symbol or reminder. We adhere to what is in the Scriptures and use bread and wine. Mormons believe God’s revelation has been given to the world through the Bible (King James OT and NT) but that the revelation of God did not end with the Bible. They teach that the Bible contains many errors and mistranslations and thus it is of lesser authority than the Book of Mormons. They hold that the Book of Mormons, translated by Joseph Smith (Founder of Mormonism), is the continuation of God’s revelation. Thus, they hold the Book of Mormons to be of greater importance than the Bible. According to the Mormons, the Book of Mormons contains the writings of ancient prophets, compiled by one of the last prophets, Mormon. These were written on gold plates and buried around 421 A.D. in New York State. According to Joseph Smith, the angel Moroni appeared to him in 1823 and told him where the gold plates were. According to Smith, he was inspired by God to translate them. There are two levels of priesthood in the Mormon sect: the Aaronic priesthood and the Melchizedeck priesthood. The Aaronic priesthood is the lower order of the two. Those who belong to this group take care of the temporal affairs of the community. It includes deacon, teacher, priest, bishops. At the age of 12, boys enter this order as deacons. The Melchizedeck priesthood includes every practicing Mormon male who has reached the age of 18 and adheres to the teachings of the Church. They are divided into elders, seventy, high priest, patriarch, apostle and president. The young men evangelizing two by two on bicycles are elders. Mormon belief states that after death all spirits go to the spiritual world where they undergo instructions and purification, waiting for the restoration of their bodies in the resurrection. Only Satan and the other fallen angels are condemned to hell forever. Other spirits are not. Instead, they will share some form of heavenly glory in one of the three heavens. The telestial kingdom is the lowest of the three and it is reserved for adulterers, murderers, thieves, liars and other evil doers. Though their sins are forgiven, they can only enjoy the eternal presence of the Holy Ghost because of their deeds. The middle heaven or terrestrial kingdom is reserved for the souls and bodies of good non-Mormons and those Mormons who were not in full compliance with the Mormon Church. These will enjoy the presence of Jesus Christ. 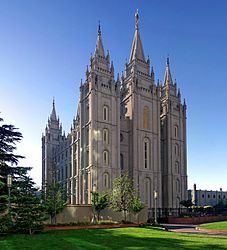 The highest heaven or celestial kingdom is the place where devout Mormons, who go on to become gods and rulers of different universes, reside. If their wives and children are sealed with them during a temple ceremony, their families will also be with them. Mormons believe in multiple universes and multiple gods. While there are other universes and may be other living creatures than human beings, we believe there is still only one God who created all out of nothing. A person can be saved even after death, so Mormons teach, if someone stands in proxy for them and they are sealed by one in authority. They believe that life does not begin at birth nor end at death but that each person pre-existed. If a person has died, that person can still repent of past sins and still be saved. Or others can have them sealed and thus they will experience salvation, even after death. As Catholics, we believe that life begins in conception and continues after death. But we believe that one’s final state of existence is determined at the time of death. There is no further chance for that person to gain salvation.